The Satin Stylist Apron #943 is made of lightweight satin polyurethane chemical proof, color proof, and waterproof material. 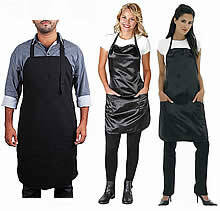 It is a lightweight, cool and comfortable roomy apron with double front pockets, adjustable ties around neck and waist. Unisex style apron.